A simple Google search of “case studies” will quickly show the truth: case studies mean different things to different industries. While they are also used in the scientific world, the process and and reason why they are used is completely different in the business world. A case study is a written account of a real customer's experience with your business. They describe the customer’s success thanks to your product or service. They typically include the problem the customer was facing before they used your product or service, and how you helped overcome that problem. On this page, we’re here to talk about business case studies – what they are, why business professionals use them, and how to write your own. And, once you’ve got those basics down, (or if you already do!) we’ve got you covered for the next step – how to write a GOOD case study, and how to maximize it to increase sales. We'll start at the beginning, what a case study is and how it works, but feel free to jump ahead to another section. Case Study Format: Written or Video, Which Should You Choose? So unless you're ready for something more specific, let's look at the case study basics! We've got lots of examples throughout this article to make you a case study expert! If you’re ready to learn more about case studies, chances are you have some involvement in B2B marketing – meaning your company sells a product or service to other businesses. In a time where skepticism and demands for buyers' attention are at an all-time high, case studies are crucial parts of an effective business-to-business (B2B) marketing strategy. You see the term “case study” in many places today, including medical journals dedicated to social and life sciences. So what are case studies? And what's the common thread uniting case studies across all industries? All case studies describe a particular research method that provides factual evidence from a specific example. The methods of business case studies are similar to scientific case studies, but instead of trying to cure diseases, B2B marketers are trying to make their offerings more compelling to potential customers. Simply put, a case study is a way to prove your product or service works, with factual evidence from your current customers. Case studies usually follow a typical story structure, which means they have a beginning, middle, and end. Think of them as a “before and after” snapshot of a customer's business – complete with quotes, statistics, and images. Business case studies are often created by the marketing team and given to the sales team. Sales can then use the case study to get a meeting with potential customers, or prospects. Case studies can also use them during the meeting to close the sale. A lot of B2B marketers tend to focus on product specifications and other statistics. Those are important for B2B buyers, who need to know that the numbers add up to make the best rational decision for their businesses. Case studies make this numbers-heavy approach even more effective. How? By bringing those numbers to life. Case studies explore how your products or services have affected specific customers. Framed as compelling stories, they help a new potential buyer visualize just how much their business could change once they invest in your solution. Above all else, case studies serve as living proof that your product really can do everything you claim. Consider them the gold standard for credibility. Now that you have a basic understanding of what a case study is, let's explore who use case studies, and how they work for businesses. Let’s start by recapping the basics. A case study is used by businesses to help sell products or services to another business. They’re created by the marketing team, but the sales team is often involved in the process of choosing the customers that are featured. Companies may have a different process for the creation of their case studies, but it is important sales and marketing always collaborate. Marketers create the case study, and working with sales helps ensure the case study will do what it’s meant to – get more customers! Think about your typical B2B website. The language you find there is broad by necessity. That's because it must reach an entire pool of potential customers. Business case studies “zoom in” on what specific prospects might be looking for. This could include highlighting a specific product or feature, and also the results it can bring your future customers. By examining a real-life example, potential customers get to see proven results. This brings credibility to your marketing materials – your product does what it says it will. Finances and accounting Accounting equals money: something that matters (and matters a LOT!) to every company. There’s also that pesky business of making sure your company meets government regulations when filing taxes. Industrial and manufacturing Industrial and manufacturing companies sell some of the most expensive (and complex) products around. Whether they're tailored to automotive companies, healthcare, defense, or anyone else, case studies help reassure buyers that they're making a sound investment. 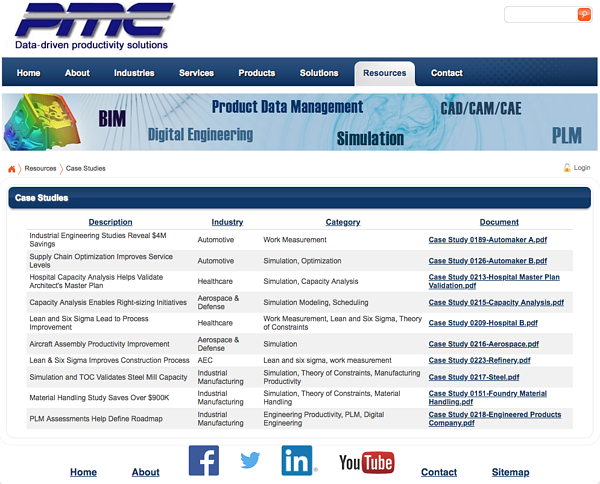 Production Modeling Corporation (PMC) includes an entire library of downloadable case studies on its website. Marketing and advertising agencies It's easy for agencies to make bold claims about getting customers more leads, engagement, and customers. But businesses are understandably skeptical. Case studies prove that they can deliver the results they promise, making it more likely businesses will give them a chance. 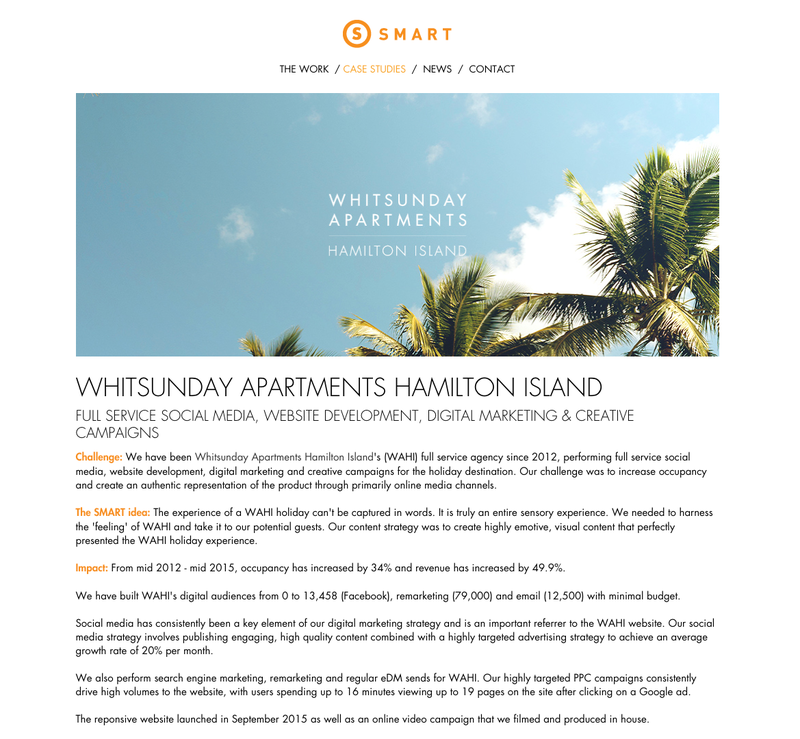 Australian advertising agency Smart combines beautiful imagery with measurable results in its case study for the Whitsunday Apartments on Hamilton Island. In addition to examples of the agency’s work, the stats speak for themselves. Who can argue with an increased revenue of 49.9 percent?! Software companies Case studies are perfect SaaS marketing opportunities for marketers to translate their product specifications and features into value that any potential customer will appreciate – even if they aren't tech-savvy. 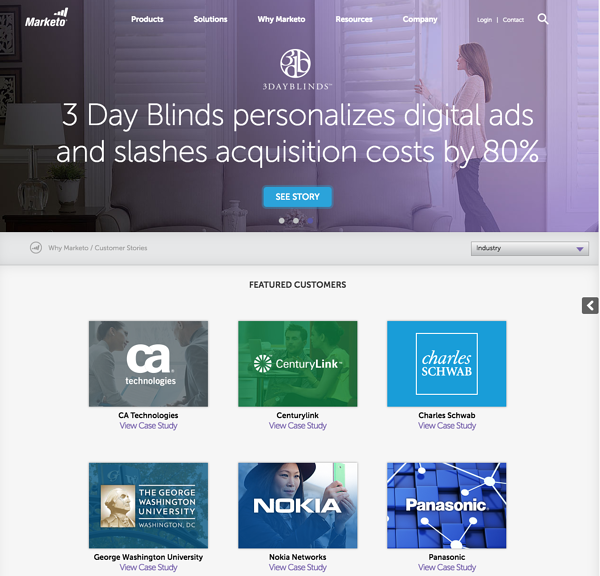 Marketo, a marketing automation SaaS vendor, devotes an entire section of its website to featured customers. Each individual case study combines written and video elements. What are the benefits of case studies? Now that you have a better idea of what case studies are and which businesses are using them, let's talk about why they use them. A staggering 73 percent of customers have used them to make a B2B buying decision within the last 12 months. What makes them so effective? Certain elements unique to case studies – their length, structure, and depth of content – make them the perfect fit for B2B marketers. To close as many deals as they can, even the most skilled B2B salesperson needs more than just conversations and handshakes. Case studies become valuable materials (called “collateral”) to help your sales representatives make all the sales they can. The proof is right there for the buyer to see. If someone is on the edge of deciding “yes” or “no,” a case study could be just the thing to tip the scales in your favor. Case studies are also great opportunities to spread the word about some of your best customers. Featuring them as case study subjects gives them free exposure, which publicizes their success. In addition, it shows them that you appreciate the relationship: a huge incentive for customer loyalty. It also adds the customer voice to your materials. B2B buyer behavior has changed dramatically the past few years. Thanks to online resources, 94 percent of buyers are researching problems and evaluating solutions all on their own – without talking to any salespeople. Case studies fit nicely within a broader content marketing strategy; they provide the information your sales rep isn’t there to give people who are well into the buying process. Empower buyers with more information to help make the best decision possible. Then, if and when that buyer does contact you, your sales rep will already be one step ahead! One of the key elements of persuasion, as made famous by Robert Cialdini's book Influence, is social proof. People want what other people want. Knowing that a business has other happy customers makes that company more valuable. By telling the story of your successful relationships, case studies prove that you've done what you claim you can. You live up to your marketing promises! This makes it easier to convince prospects to give you a chance – especially if the customer featured in your case study is a well-known company. Countless B2B marketers are creating content and distributing it online to attract customers, and finding perfect topics can be difficult. Every case study is unique because every case study subject is unique too. Working with your sales and customer success teams, you can discover customer stories with a wide range of variables that different prospects can relate to, such as company size or location. Case studies give marketers the opportunity to translate key features and benefits into a compelling narrative. Storytelling engages us emotionally in a way that reading lists of statistics doesn't. This one-two punch – resonating emotionally and logically – is the biggest strength of case studies, and a key aspect of great marketing! While looking at some of those example case studies from various industries, you may have noticed a quote in each. This type of quote is considered a testimonial, which is a key element of case studies. Not exactly. Case studies are much longer and more in-depth than testimonials. A testimonial is just one piece of a larger puzzle. Customer testimonials are quotes from happy customers. These quotes affirm that your product or service worked like you said it would and provides value. They can also speak to your company’s customer service. Testimonial length varies, but most are just a few lines long. This testimonial is effective because it focuses on specific results every customer will value: more sales. Also, giving the name and title of the person who said the quote gives added credibility. It’s a real person – you can even look up Brian and his restaurant. This testimonial is from a director at a well-recognized company. This gives the same advantage of consumer reviews that show the writer's company and title. It shows that LeadMD works for the company’s decision-makers, providing high-level strategy and guidance. Plus, LeadMD provides Mr. Bricker’s picture, again connecting the testimonial to the real person who said it. Let’s face it – no one is too excited by the topic of insurance. Not many people get excited when they need to call their insurance agent, and anyone in sales has a tendency to bring out one’s cautious side. 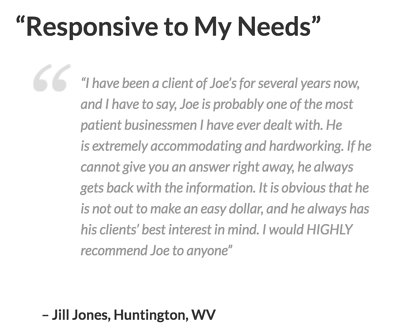 This testimonial quells the fear of an insurance agent who acts like a “typical salesman,” instead showing levels of customer service that go above and beyond. It also calms a prospect’s fears that the agent is after their money, instead of trying to actually help them. Now that we’ve got an understanding of what case studies are and why people use them, let’s talk about format. As technology has changed, so have case studies – they can now be in video format, too! Or, if you’re ready to start writing you case study, you can skip ahead to Chapter Three, How to Write a Case Study. The same way every customer's success story is a little different, so is every case study. Just 10 years ago, case studies only came in one format: written. However, with the rise of video content creation (by both marketers and consumers), there is now a new case study format! We’ll take a look at pros, cons and examples of both written case studies and video case studies. Written case studies are the most traditional case study format. They've been around for a long time and continue to be effective today. Readers get a visual representation of the data, and the ability to scan and focus on sections most important to them. Prospects can also save these case studies for future reference, or share PDFs and landing page links with coworkers or decision-makers. You'll see print versions of case studies handed out at trade shows or networking events. They also make great sales collateral: documents salespeople can give qualified prospects to read and move them closer toward making a buying decision. Nowadays, many written case studies are available in digital format. 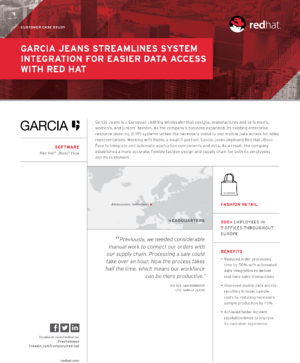 Some companies share their case studies in a PDF format, such as this B2B case study by RedHat, a company that provides enterprise companies (those with 1,000-plus employees) with open-source software products. 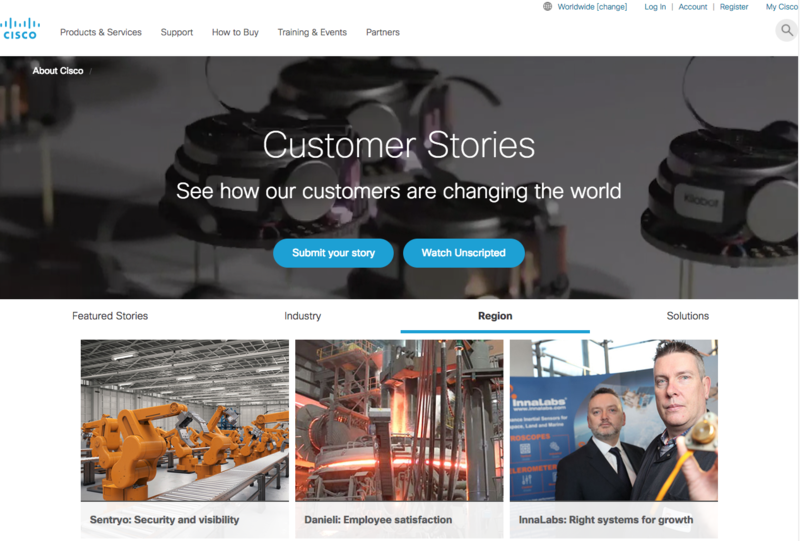 It is common to see B2B brands, like Cisco, which sells technology services and products, have entire libraries of case studies that readers can filter by industry, region, or the solution offered. Instead of a PDF, some companies will have their case studies as landing pages. (Think of a landing page as any individual page on a website. When you’re surfing the web, it’s where you land, or enter a site!) It's also common to see businesses directing web traffic to specific “landing pages,” MediaValet, which helps manage customers' digital assets on the cloud, requires visitors to enter their work email address to download case studies. 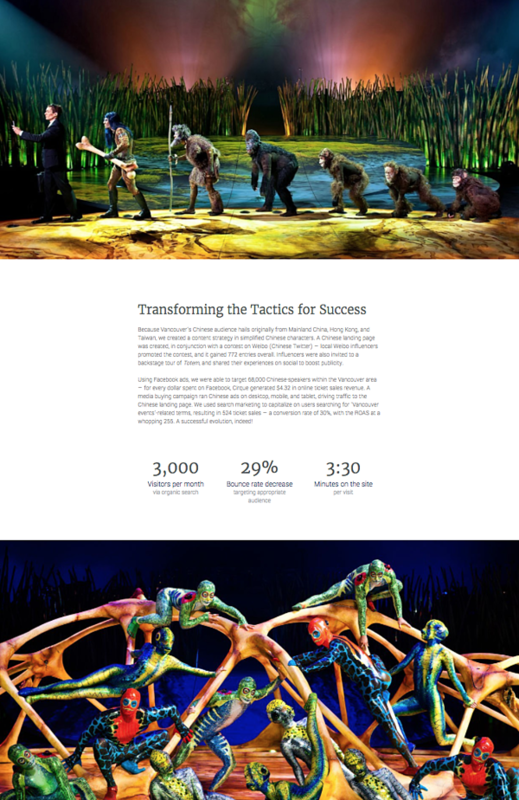 S6, a digital marketing agency, uses a landing page case study to maximize the impact of its campaign for Cirque du Soleil. S6 has the statistics to prove the campaign was successful, but it also has beautiful images displaying Cirque du Soleil performances. This grabs your intention and draws in emotion. Whether your case study is a PDF or a landing page, the format allows you to use hyperlinks within your content. You can put as many links as you want (make sure they are relevant, of course! ), giving prospects the opportunity to find additional information if they have questions. You can also link directly to an email address or “contact us form,” enabling prospects to easily take the next step. Instead of having to set up a time and fly out to film your best customers (or have them fly to you! ), written case studies offer more flexibility and less commitment from clients. You can do it via phone or video streaming services such as FaceTime or Skype. If someone needs to rearrange the interview time, it’s not a problem – you’re not canceling or rescheduling on a big production crew. If needed, you can even email your customer a list of questions. Someone may want to learn additional information about your company but only have limited time. Especially when you utilize a great case study format, making it easy to scan, prospects can take a quick look and scour for information most relevant to them. Charts and callout boxes featuring stats are especially helpful for this. 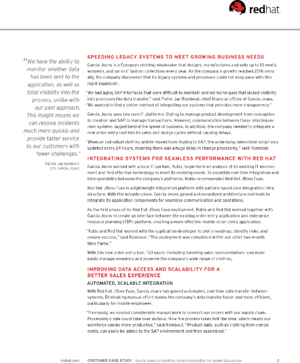 You can print out written case studies and take them with you to trade shows, sales calls, and other live events. It's easy to hand them out to busy event attendees, or leave with prospects after in-person meetings. While many people prefer digital, there are people who like a tactile sheet of paper to hold. Written case studies give that option. Video, on the other hand, makes it difficult to hand over something physical! Written words pack less of an emotional punch than seeing a real live human describe the experience. Video can set a mood and engage additional senses with emotion. Even when you're marketing expensive B2B products, emotions have an impact on sales. MRIs have even shown that when evaluating brands, consumers utilize emotions over facts such as product features. Utilizing quotes, images, and storytelling in your case study are a great way to still get the emotional connection. Creating a great case study is more than just spitting words onto the page. You'll need an editor and proofreader, as well as coordination with designers so everything looks super professional. Written case studies also go through multiple revisions and approvals before publication. Attention spans are shortening. As of 2014, it was believed we were exposed to more than 5,000 ads a day, and chances are that number is only growing. In fact, some studies have shown our attention to be less than that of a goldfish! Without audio or video elements, case study writers must work that much harder to engage readers. Adding graphics to your case study, and breaking up the text, can help combat that. While we looked at a few examples of written case studies above, the options for what text to include, and how you lay it out, can be almost endless. Here are a few more examples to get you inspired and spark those creative juices! This written case study from media company Contently is short and sweet. But notice the logical structure (challenge, solution, results) and attractive design. 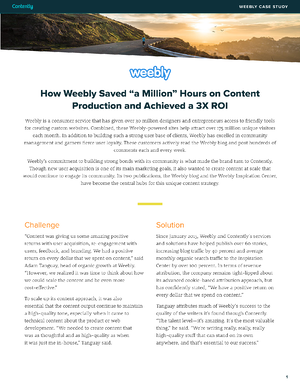 Knowing the importance of ROI to any business, it starts with its product tripling Weebly’s ROI. On the back page, those results are front and center; there’s no way you can miss them! This marketing agency seamlessly incorporates written case studies onto its website. The screenshot only shows the beginning of the page, but once again you can immediately see the results. They are big and bold – the first place your eyes go! The quote also serves as a fabulous testimonial, and including Rachel’s picture connects your brain with the real person who said it. In addition, as a landing page it is interactive – you can click and view the challenge, solution, and result. 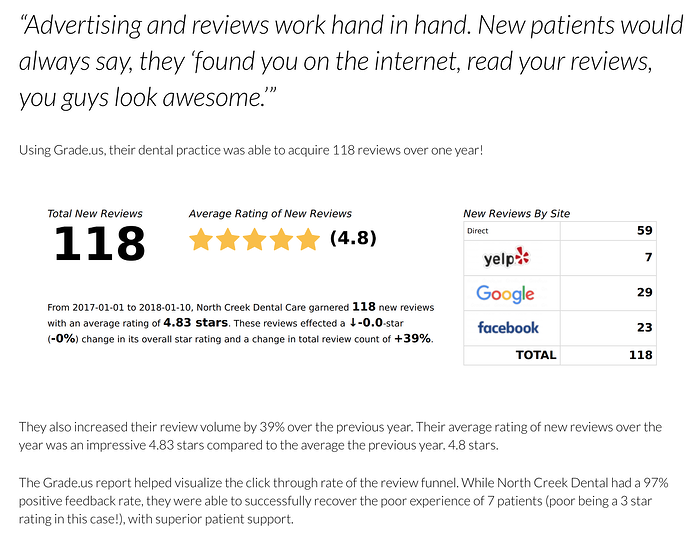 The Grade.us review management platform case study used a combination of report generated data and tangible benefits (stars that appear in the customer's organic search results) to show both the analytic and visual benefits of the service. Grade.us also showcased the actual use of the service (the review funnel) and generated a few emotional pull quotes from the happy customer, which highlights the value that any future customer would benefit from using the platform with their own business. Just like written case studies, video case studies dive in deep about the struggles a specific customer faced – and how the business solved them. But video does more than a headshot can, connecting you with the person who both experienced the problem and came out triumphantly: thanks to your company, of course! Video case studies offer the possibility for increased brand exposure by putting them on your YouTube channel. Team collaboration software company Slack created a short case study video featuring production company Sandwich Video. The video is fun, engaging, and gives viewers a taste of how Slack changed the way the Sandwich Video team works. It also engages viewers with a sense of humor – something that can be more challenging in a written case study, where people expect exclusively factual evidence. Oh, and did we forget to mention? This video case study has racked up almost a million views on YouTube! It's hard to say which case study format is “best.” Each has its own advantages and disadvantages, so deciding which one is right for you depends on your company and the situation. Let’s dive further into the advantages and disadvantages of video case studies. Video case studies allow us to see the faces behind the success stories. When you see a person, hear their voice, and observe their non-verbal communications, your brain makes a stronger connection to them. You develop a true impression (and opinion!) of them. Statistics are impressive, but it is easier to relate with another human being. Reading a quote is one thing, but hearing it and seeing someone say it engages other senses. It also gives more credibility. Prospects know that a company hasn’t put any “spin” onto an interview conducted behind closed doors. Plus, video case studies can still incorporate charts, statistics and images. Additional elements, such as music, also help set the tone and invoke emotions. Marketers can embed videos directly on their websites, as well as post them on huge platforms like YouTube and Vimeo. In addition, videos can be shared on social media, and often have higher levels of engagement. This increases reach and gives them access to different audiences. Videos often perform better in your social media marketing as well, giving you increased traffic and engagement with your audience. Video isn't as prohibitive as it used to be, But the higher the production level, the better your brand will look. Cameras, lights, microphones, and video editing software can be expensive to rent – let alone buy! In addition, you need someone skilled enough to know how to edit videos. Hiring a production company ensures your video looks as amazing as your company is, but there is a wide range in what they charge. However, technology keeps improving – look at the pictures you can take on your phone! Easy and free video editing software tools continue to emerge as well. If you decide to produce your own videos, make sure the results meet a minimum standard. If your production level looks amateur, you risk your brand considered amateur by association. Some busy prospects prefer written formats because they can read much faster than people speak. They can also navigate back and forth at their own pace and easily scan for key information. In addition, most people associate video with sound. This is a disadvantage for people who may come across your video at work or on the train. If they don’t already have those headphones plugged in, how many will dig them out to watch your case study? Knowing this interview is going to be preserved for all time can bring about the nerves. And, even if someone is confident, the camera can be a funny beast. The most charismatic person in real life can come across reserved on camera. If someone hasn’t been on screen before, you risk not finding out until it’s too late. A global business design partner of IBM, this digital marketing and creative firm created a video case study that illustrates the story behind Wendy’s phone app. Video gives the opportunity to illustrate exactly how the app works in a way static images can’t. But like written case studies, it still includes statistics. When you create an app downloaded over 225,000 times in a few short months, it doesn’t matter if your case study is written or video – that’s a stat you want to share! This video case study is simple but effective storytelling. By opening with Americo Silva, the credibility of the video is established thanks to his title. Americo immediately goes to the heart of their business – who Shell’s consumers are. By mentioning a variety of customers – car lovers, mothers picking up their children, and B2B customers – the case study gives viewers several people to identify with. Silva also identifies a key challenge faced by marketers: the need to identify and anticipate consumer behavior in relation to media consumption. Then he explains how Google products, such as YouTube, have helped overcome those challenges. This beautifully shot and edited video case study highlights how a company in the “traditional” industry of banking used Salesforce to adapt to a social and mobile-centric world. Now that you know the pros and cons of each, how do you choose which is right for you? One of the biggest factors in doing video case studies can be the technical expertise and equipment required for a high level of production quality. Whether or you have the budget to do this in house, or hire a production company, can be one of the major deciding factors. Still, written or video doesn't have to be an either-or decision. Some B2B companies are using both formats. They can complement each other nicely, minimizing the downsides mentioned above and reaching your potential customers where they prefer. Let's say you're selling IT network security. What you offer is invaluable but complicated. You could create a short (three- or four-minute) video case study to get attention and touch on the major benefits of your services. This whets the viewer's appetite for more information, which they could find in a written case study that supplements the video. Each format has its strengths and creates a more engaging experience. Plus, because most B2B buying decisions are made by committees, different formats will appeal to different stakeholders. No one feels left out. Should you decide to test the water in video case studies, be sure to test their effectiveness among your target audience. See how well they work for your company and sales team. And, just like a written case study, you can will always find ways to improve your process as you continue exploring video case studies. Understanding how to write a case study is an invaluable skill. You'll make decisions large and small – everything from deciding which customers to feature, to the best format to use – to design and making them as engaging as possible. This can feel overwhelming in a hurry, so let's break it down. If you've been in business for a while, you have no shortage of happy customers. Which one should you feature in your new case study? With limited time and resources, you can't choose everyone. Start by considering the case study's place in your overall marketing strategy. In most situations, you'll use case studies to help win over prospects who are close to making a buying decision. What are their business challenges we can solve? Which industries do these people represent? Who are the key people making buying decisions? Take some time beforehand to flesh out your target buyer personas. Many B2B companies already have these in mind. If you are a marketing service provider, such as a branding agency, you may want to consider asking customers to participate who show off the types of marketing you can execute, such as experiential marketing and omnichannel marketing. Typically it's the marketing team responsible for creating content. But having marketing handle case studies on their own is a mistake. Bring in the sales team as well. Their insights from countless conversations with prospects are invaluable – who knows better what your customers want to hear than the people who speak to them every day?. The ideal situation: have sales and marketing work together to create the most accurate buyer persona possible. Once you know exactly who you're targeting, go through your stable of happy customers to find a buyer representative of the audience you're trying to reach. The closer their problems, goals, and industries align, the more your case study will resonate. What if you have more than one buyer persona? No problem. This is a common situation for B2B companies because buyers comprise an entire committee of people. You might be marketing to procurement experts, executives, engineers, and a whole lot more. Try to develop a case study tailored to each key persona. This might be a long-term goal, and that's fine. The better you can personalize the experience for each stakeholder, the easier it is to keep their attention. Some B2B companies have a regular case study production calendar. It takes time and employee resources to execute, but it might make sense for you because it produces a consistent output. Though you have many happy customers, you won’t always have some eager to share results. If someone reaches out all on their own, they're showing a willingness to help out. Thank them for their feedback and try to set up something more formal: a case study interview. B2B products tend to be expensive, complex, and require a long-term investment. That makes them all the more challenging to sell when they're new. If you've successfully beta tested or launched a new product/feature, and had a few people use it with great success, approach them about a case study to help boost your credibility. Having an early adopter advocate for something new will help squash concerns from other prospects. As B2B businesses expand into different geographic areas, case studies can help pave the way. This is a great way to show your target audience in the new area that you're capable of satisfying their regulations, customer expectations, and any other concerns. Such a case study will also feature a company that likely is familiar to others in the area. Case studies can help skeptical prospects overcome last-minute objections and finally decide to buy. If the sales team is noticing a lot of people getting this close to buying, only to back out at the last second, empower them with more case studies. Within them, you have the opportunity to address the objections prospects have before they become a deal-breaker – and prove you can deliver what you claim. Some customers might have a case study written into their contract. This guarantees that they'll be available when you call on them. Then it just becomes a matter of coordinating schedules and getting the information you need. However you decide to handle the case study process, the important thing here is effective communication. Talk transparently and consistently as you develop a strategy to choose case study subjects, gather information, and present in a compelling way. Unless a happy customer reaches out to you directly, you'll have to decide which ones to approach about becoming case study subjects. Limited time and resources force you to be selective. These items are just a jumping-off point as you develop your own criteria. Once you have a list, run each customer through it to determine your top targets. Approach the ones on the top (your “dream” case study subjects) and work your way down as needed. There's no one set way to ask customers to participate in case studies. Some companies stick to email. Others prefer picking up the phone or even discussing it in person. First, make it as easy to work with you. Your customer’s time is valuable, so respect that as much as possible. The better prepared you are, the smoother the process will go. Ask as little as possible of them you can. It might help to sketch out the interactions all the way from initial request to customer approval of the completed case study. Once you identify the key interactions, you can get organized and develop a system to make them run smoothly. Second, remember to emphasize how the customer will benefit from participating. Talk about the publicity they'll get, whether it's potential revenue-boosting opportunities or just recognition for a successful project. Here's an example: If a procurement specialist waded through dozens of products before finally choosing yours, and that decision increased the company's revenue by 30 percent, remind him or her that a case study is a chance to put that success “on the record.” They get acknowledged in their company as someone responsible for that incredible success! Because you'll probably have different people on your team requesting case studies, you could create a script that incorporates these principles. This standardizes the process so you know exactly what to say. You can also track performance – and experiment with different appeals. Once you find a customer willing to participate in your case study, it's time to set up an interview. This interview will give you the specific information you need to write the most engaging case study possible. Case study interviews are kind of like exams in school. The more prepared you are going into them, the better they turn out. Preparing thoroughly also shows participants that you value their time. You don't waste precious minutes rehashing things you should have already known. You focus on getting the information you need as efficiently as possible. That starts by getting as much information on the customer as you can. Which products or services are they using? How long have they been a customer? What did their interactions with your company look like before they decided to buy? Run this by the relevant account manager to get all the details. Memories fade, though, especially if they've been a customer for a long time. Confirm everything with your historical records as well just to be sure. Once you've gathered preliminary info on your case study subject, shift your focus to your target audience. Consider what makes them hesitant to buy. Which pieces of information do they absolutely need to know? If you're targeting prospects with a more technical focus (engineers, IT experts, etc.) they'll want more specifications and data. Pinpointing these major considerations now makes all the difference. We can't afford to assume that case study participants will volunteer this information on their own. Asking the right questions draws out the all-important answers, which brings us to the next section. Before you interview your case study participant, figure out which questions you'll need to ask. Going into an interview with a list will keep you focused. Let the research you've done be your guide. You already understand the history between your business and the case study participant. No need to ask about it. You also know what's important to the audience you're trying to target, so you can craft interview questions to draw out that information. Remember: you'll be structuring your case studies like a story. That means you need a beginning, middle, and an end. Delve into the customer's challenge that led them to ultimately do business with you. What were their problems like? What drove them to finally make a decision? Why did they choose you? Your audience also wants to know about the experience of working with you. Your customer has taken action to address their problems. What happened once you got on board? Describe the specific results your company produced for the customer. How has the customer's business (and life) changed once they implemented your solution? When in doubt, think of the “golden rule of interviewing.” Ask open-ended questions! The quality of the answers you get – and the case study itself – will improve dramatically. Also, don’t be afraid to go off script. If your customer gives you an answer that leads to something interesting and unexpected, definitely follow up to get more information, even if the question wasn’t on your original list. If you're preparing for a case study interview and still aren't sure how to get started, don't worry. Have a look at these 10 sample case study interview questions. This list isn't comprehensive, but it will get you thinking in the right direction. What challenges did you experience before deciding to start looking for a solution? What went into your decision-making process? Which criteria did you use to choose a B2B solution, and who was involved? What made our product or service stand out from all the others? What was your experience working with us after purchasing our solution? Was there anything about working with us that surprised you? Exceeded your expectations? How easily did your team adopt our product or service into their workflows? How long did it take before you started seeing positive results? How have you benefited from our products or services? Would you be willing to share some specifics? How do you measure the value our product or service offers? Hopefully those examples got your mind churning about what to ask. To get access to even more questions, you can download our ultimate list below! Now that you have your questions prepared and a willing customer ready to answer questions, the only thing left to do is conduct your case study interview. This is your chance to get the information you need to tell a story. With responses in hand, it then becomes a matter of structuring them into an engaging narrative. Which Format Will You Choose? You can conduct your case study interview in multiple formats – everything for exchanging emails to having the interview in person. This isn't a trivial decision. As you'll see in the chart below, each format has its own unique advantages and disadvantages. How Should I Conduct My Case Study Interview? Being able to see each other's facial expressions puts everyone at ease and encourages case study participants to open up. Good format if you're conferencing with several people from the customer's team at once. Always be on guard for connection issues, and not every customer will be familiar with the technology. Audio quality probably won't be as good as on the phone. Pieces of conversation can be lost when multiple people are talking. More personal communication style than email because you can hear someone's tone. If they get really excited about certain answers, you can encourage them to continue. Convenient and immediate. Dial a number and start interviewing without ever leaving the office. Isn't as personal as video chat or an in-person interview because you can't see the customer's face. Non-verbal cues might be missed. Don't get direct quotes like you would with email responses. The only way to preserve the interview is remember to have it recorded. The most personal interview style. It feels like an informal conversation, making it easier to tell stories and switch seamlessly between topics. Humanizes the customer's experience and allows you to put a face to the incredible results. Puts a lot of pressure on customers who are shy or introverted – especially if they're being recorded. Requires the most commitment for the participant – travel, dressing up, dealing with audiovisual equipment, etc. Gives customers the most flexibility with respect to scheduling. They can answer a few questions, see to their obligations, and return to them at their convenience. No coordination of schedules needed. Each party can fulfill their obligations whenever they're able to. Less opportunity for customers to go “off script” and tell compelling anecdotes that your questions might have overlooked. Some of the study participant's personality might be lost in their typed responses. It's harder to sense their enthusiasm or frustration. Who Will Participate in the Interview? You'll also have to consider who will ask, and answer, the questions during your case study interview. It's smart to start thinking about this while you're still considering case study format. Why? Because the number of participants factors into which format will work best. If you're trying to juggle four or five people's busy schedules, for example, it becomes that much harder to pull off an in-person interview. Maybe try a video conference instead. At a bare minimum, you'll need two people to participate. A one-on-one interview can work well because it encourages the interviewee to open up. Imagine an easy chat with a friend, rather than answering to a panel. There's less worry about making sure everyone is heard and no one dominates the conversation. Bringing in multiple interviewees creates a logistical challenge, but it offers the advantage of different perspectives. After you get the information you need, you can weave in these different stories to make a broader narrative. Your account manager or sales rep will probably have the closest relationship with your customer. But you can't assume they'll know exactly what to ask. That's why it makes sense to have a marketer there prepared with the most important questions. You might want to interview top-level managers or executives because those are high profile positions. But consider how close they are to your product and its results. Maybe it would be better to focus on an office manager or engineer who uses your product daily. Look for someone with a courtside view of the effects. Who asks the questions? That's up to you. Whatever you choose, make sure you decide before the interview to avoid any confusion. It's easy to embrace the assumption that interviewing isn't much different from everyday conversation. You talk to your family, friends, and coworkers all the time. What makes this any different? The reality: Conducting case study interviews isn't always as easy as people imagine. It's a skill (like negotiating and public speaking) that you can refine with practice. Case study interviews don't need to be rigid. If you're working your way through your questions and your interviewee brings up something you didn't expect, go with it! Allowing them to go “off script” is where their human side shines through – along with the most precious feedback. Make interviewees feel comfortable before getting started. Don't just jump straight into “interview mode.” Put your interviewees at ease with a little smalltalk about their business and other personal information you might know (hobbies, vacations, favorite sports teams, etc.) Once everyone is comfortable, ask if they have any questions or concerns before getting started. Get those out of the way first. It's impossible to predict how long it will take for an interviewee to answer questions. Some people are more talkative than others. You want to be respectful of your customer's time, so lead with your most important questions. If you aren't doing your interview via email, you'll need to record it or else risk losing the valuable gems. Ask the customer if this is okay before you get started, and reassure them that you won't release anything without their consent. Recording lets you focus on them without scribbling notes and wondering whether you're getting it all. Then you can play back the recording and pull out all the insightful quotes. With your interview wrapped up, it's time to take the insights you gained and turn them into a case study. The challenge becomes figuring out how to structure everything so it's as compelling. You want to leave your audiences with a story that grabs their attention, not just a list of data. Let's walk through the process one step at a time! For people who don't write often, the writing process can seem a bit overwhelming. But there's no need to be the next Shakespeare or Hemingway. We can take comfort in the fact that we're simply trying to communicate. Nothing needs to be perfect the first time around. That's what revisions are for! One of the best things you can do to stop agonizing over the writing process? Stop thinking of it as writing and start thinking of it as “written storytelling.” That's what case studies are when they're at their most effective. Once you grasp what makes stories powerful, you'll know what to say and what to leave out. And you'll even know how to arrange everything so it resonates with your audience. Case studies are written by businesses for businesses. That said, it's people who are reading them and making the buying decisions. Applying the art of storytelling will make your case studies irresistible. No one can resist a great story. As busy as we are, we're still making time to watch “Game of Thrones,” go to the movies, and tell our friends about that hilarious thing that happened today at work. It has been like this ever since humans started communicating. When we listen to stories, mirror neurons in the brain fire to make us feel like we're experiencing the sensations being described. We are “hard-wired” to tell them, listen to them, and use them to relate to the world. You might be a great storyteller already. Being exposed to countless stories ingrains their patterns on a subconscious level. Once you understand the elements consciously and apply them to your case studies, it's like a secret recipe to make them unforgettable. Best of all: It doesn't cost any more money to tell an awesome story than an awful one. It's a great equalizer, even if your competitors have larger marketing budgets. Creating the perfect writing style for your case study starts by thinking about the audience. A network security specialist, for instance, will be a lot more amenable to technical jargon than an overwhelmed executive who isn't tech-savvy. Your writing style is also a reflection of your company brand. 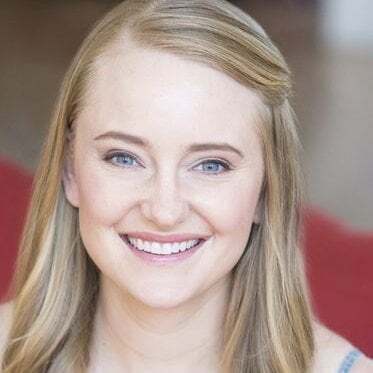 If your website, logo, and social media posts all embrace a lighthearted conversational style, but your case study is denser than James Joyce's “Ulysses,” the mismatch will confuse readers. Imagine a Venn diagram. One large circle contains all the language and preferences of your target audience. The other contains the tone in writing your brand has already established. Focus on that overlap for the ideal approach. There's no need to force yourself to try to write beautifully. Put down that thesaurus! Don't use “antiquated” when “old” will do. When in doubt, favor clarity over cleverness. Remember the end goal: communicate your message in a compelling way. 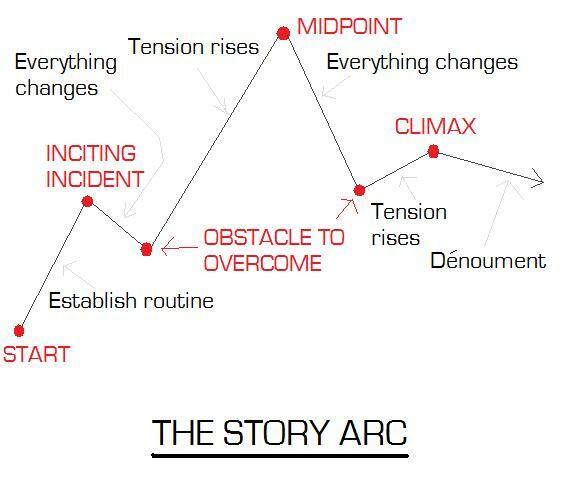 Every great study follows a narrative arc (also called a “story arc”). This arc represents how a character faces challenges, struggles against raising stakes, and ultimately encounters a formidable obstacle before the tension resolves. It's a visual representation of the plot. Narrative arc transcends genre. You'll find it in mystery stories, romances, comedies, and everything else you can think of. Apply it in your case studies, and you'll bring them to life! This is the background information of the company. It gives readers a taste of who the subject is and what their “old life” looked like prior to becoming your customer. This is the problem that drove the customer to start searching for a solution. Whatever it was – losing customers, horrible productivity, frustration with a high-priced provider – that made them decide they couldn't go on like this anymore. This describes the customer's search for a solution. The tension rises steadily as they research and compare different options. Here's where everything changes. Discuss what finally drove the business to become your customer. What made you stand out? What were the most important factors in their decision? This is where you explain the success your product helped them achieve. Finally, here’s what the customer's business looks like moving forward. The final paragraph leads to a call-to-action (CTA), where you ask your reader to contact you, request a free consultation, or take another simple step to continue the relationship. Now that you know what the key plot points are, let's see how they fit together. Took a look at the following plot diagram from writer F.C. Malby. An upward slope represents rising tension and challenges. A downward slope symbolizes the opposite. Your case studies don’t need to be the greatest literary works of this era, but following these arcs that your potential customers are familiar with will help the message resonate with them. Even if you are the next Hemingway, there's still something more powerful than your words: direct quotes from your customers. Whenever possible, incorporate customer testimonials at every stage of the process. Hearing about a customer's experience in their own words is much more influential than hearing it from a salesperson or marketer. Using testimonials positions the customer as the “hero” in the story. Your audience has someone to root for and relate to. And, if you're selecting case study subjects carefully, it's easy for the audience to imagine themselves in the customer's shoes because they are facing similar challenges. 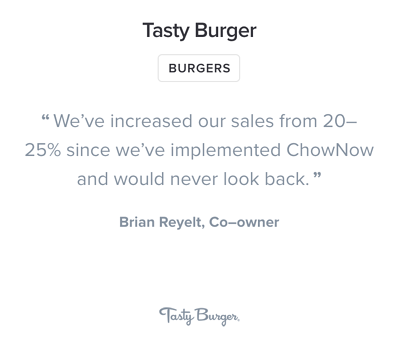 If you'd like a few ideas about what great testimonials look like and how you can use them, just refer back to our examples in Chapter One: Understanding Case Studies. You've heard the old adage about not judging a book by its cover. But the reality? People are doing it all the time! You could have a wonderful case study, but with a poor layout, no one will read it. Start with a compelling title. You probably wouldn't read a newspaper article if the headline didn't catch your eye, and case studies are no different. Your marketing and sales teams can work together to brainstorm different options. It's a good idea to keep your title benefit-focused, like this example from HubSpot (“Stellar Recruitment Increases Leads by 5037% with HubSpot”). Next, arrange your content and break it down into different sections – like challenge, results, and so on. Each section can also have subsections. Divide the content into digestible chunks so no one feels intimidated by walls of text. Finally, don't go on any longer than needed. The best case studies are exactly long enough to introduce the customer's challenge, their experience working with you, and their remarkable results. Focus on clarity. Skip any sections that lose the plot. Case Study Writers: Should You Outsource? Some B2B companies choose to outsource the case study writing process. This is a case-by-case decision. What's best for your company might not be right for your competitor. It might even make sense to write this case study yourself, then outsource the next. Cost is the first consideration. Obviously it costs more to bring in outside help than rely on someone who you're already paying. Expert B2B case study writers can be expensive. But if your budget allows, it's a guaranteed way to get a professional product. If you decide to write in-house, remember the opportunity cost. What else could your team have done with that writing time? Another factor is perspective. While outsourcing a case study writer will leave you with a professional product, no one understands your customers or products like you do. The same goes for your target audience. Because you've spent so much time getting to know them, it might be easier for you to “speak their language” and connect on a deeper level. Finally, think about how much the end product will likely change from the first draft. Some outsourced case study writers offer only a limited number of revisions. You don't want to end up paying more than anticipated. Briefing Your WriterIf it makes sense for you to hire an outside writer, there are a few things to think about before the case study interview. Some outsourced writers are also willing to interview your customers. They've spent years perfecting their interviewing skills and include this as part of the arrangement – or make it available for an extra charge. Having an outsourced writer interview your customer might make sense if they're great at what they do. However, your team knows the customer better. So the customer is probably more comfortable talking to you. These are just things to be aware of. We've already mentioned how written case studies aren't the only format available. What if you want to tell your customer's success story on video? Who Will Produce the Video? Plenty of professionals are available to help. Before you decide whom to hire, though, make sure you have a solid understanding of the costs. These include the production itself, as well as rounds of editing. How many rounds are included? What will it cost if you exceed them? Video Case Studies: Should You Outsource Production? Producing your own case study videos is cheaper than outsourcing the job. Each video you produce is an opportunity to develop your skills and craft more compelling narratives. The production quality is probably going to be lower than it would if you outsourced. You're committing your team to a significant time investment they could have spent working on other marketing projects. You might not have all the equipment needed for the job – especially if you're filming in an unusual location. The production company will have a wider variety of cameras, microphones, and lights to get quality footage regardless of the circumstances. It's easier to predict how long it will take to finish – as well as the costs involved. You get access to experience and specialized knowledge you wouldn't find in-house. You miss out on an opportunity to develop production skills in-house. Video production and editing is expensive. The more required, the more expensive it gets. You give up some creative control, and it takes longer to make changes because the video company is also serving other clients. Some companies settle on a third option. They handle production themselves, then outsource editing. This could be worth exploring if you have the equipment and knowledge needed to shoot, but don't want to spend hours editing footage into a compelling story. Setting the Tone: Music, Fonts, and Color GradingJust like a written case study has a tone, so too do video case studies. The only thing that changes is how you create it. Using video case studies gives you more than just moving images – you also get to play with audio. When used well, music can support your message without being distracting. You can use special intro and outro music to “bookend” your story and give viewers a sense of completion. Higher frequencies convey happiness or “you can do it” emotions, while lower frequencies signify power and reliability. Take a look at this incredible post from Vidyard for more information. Video also gives you the ability to use written text, whether it's labeling someone's name, displaying a direct quote, or numerous other possibilities. Take some time to understand how your font choices can affect emotions. Choosing wisely will complement your brand and the tone of messaging you want to convey. You also get to decide the lighting used to shoot your video case study. Color grading is the process of altering or enhancing color with digital tools. It breaks down into three elements: highlights, shadows, and midtones. Changing them affects the mood dramatically. Brighter colors convey an energetic, upbeat tone, while warmer hues are more relaxed – like a conversation in front of a fireplace. Once you've finished the interview and created your case study, the hardest part is over. Now's the time for editing and revision. This might feel like a frustrating step for impatient B2B marketers, but it can turn good stories into great ones. The first stop for editing and revision lies within the walls of your own business. What does your team think? Is your case study as captivating as it could be? Are there any embarrassing typos or grammatical errors? You'll get the most from this feedback by bringing in a range of perspectives. Marketing might think it's great, for example, but sales could offer important suggestions for improvement. Whenever possible, run your case study by the people who spend the most time talking with (and serving) customers. This could be anyone from managers to customer support specialists. Once you've gathered enough feedback, patterns emerge. Use them to guide your revisions! Then keep these in mind for any future case studies you work on. The second layer of feedback involves taking the case study to the customer. This makes them feel like a valued contributor. It also gives them a chance to check the quotes and data points to make sure they're accurate. Because your customers are the “heroes” of your case studies and their logos will be featured prominently, make sure to run the study by them before publishing it. The last thing you want to do is damage a valued relationship with a great customer. Your case study is ready to go. Awesome! It has been a lot of work, but it's bound to pay off with more credibility and interest from potential new customers. Where you decide to publish your case study depends on its role in your overall marketing strategy. If you're looking to share your video case study to as many people as possible, then by all means, publish it on YouTube and Vimeo. Some B2B companies prefer to keep their case studies exclusive. They make them available only to people who specifically request them. Before you make your case study public, run through it one more time and make sure the following details are in place. A great story deserves a great package. This is especially true today, when we have endless ways to distract ourselves with social media, texting, and media consumption. Beyond white space, there are plenty of other ways you can break up text. Incorporate visual elements like call out boxes, bulleted lists, and sidebars. A nice variety keeps things interesting. Images are great for breaking up text-heavy content. They can also summarize results or simplify complex topics. A good image is worth a thousand words of explanation! Walls of text intimidate readers. If reading your case study looks like hard work, they'll find something else to do instead. Use plenty of white space to make it as easy as possible. Break your story down into sections, and even shorter paragraphs and subsections. Use short words and short sentences. The idea is to have readers' eyes glide effortlessly down the page. Now that you've found design perfection, there are only a few small steps left before you're ready for publication. Proofread your case study one more time. Even if you're fairly confident you've caught all the errors, new ones can crop up when you incorporate content with a designer. Your case study will be an effective marketing tool for years to come. It's worth the investment to make it perfect! 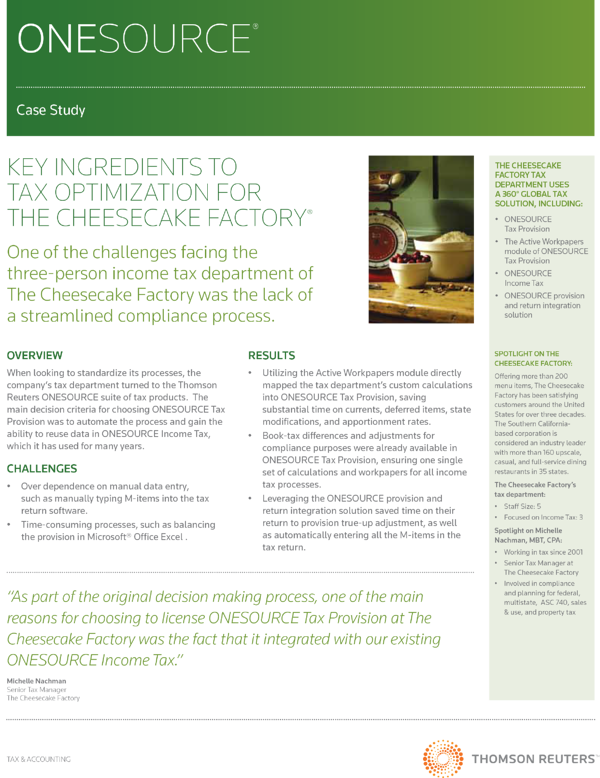 Finally, send a copy of the completed case study to your customer. They'll appreciate the gesture. Some customers will want to hang onto it for their records. It couldn't have happened without them! They deserve to see the final product once it's polished. Phew! You've just spent a lot of time and effort creating your case study. Which brings us to the next question: How can you make the most of it? Business case studies differ from scientific research studies in the need for internal support. Meaning, you want your sales team to use them! You are just one person at your company, and marketers are usually not the ones sharing a case study directly to prospects and customers. Making sure all relevant parties at your company know about the case study is imperative to make sure it has the maximum effect. For example, aside from sales, your customer success team may be able to utilize case studies for retention and upselling. Case studies can be just as valuable to your own sales team as your target audience. Unfortunately, some companies focus so much on external distribution that they forget the internal part. Salespeople thrive on personal interactions and developing relationships. But when they can also draw on impressive, relevant case studies, it's easier to persuade reluctant prospects to buy. Case studies become “sales collateral,” the documents and hard numbers needed to support their points. To get the most of your case studies, make them readily available to the sales team and communicate whenever there's a new study published. The last thing we want is for a library of resources to pile up without the sales team ever knowing about it. Carve out a few minutes during regularly scheduled sales meetings. You could have someone from marketing attend and update everyone on the latest case studies. Open the conversation up so the sales team can bounce ideas off one another about the best ways to use them. Beyond regular communication, empower your sales team by making case studies available in email-friendly formats. Consider how they interact with prospects. It's usually easiest to email a PDF file or link to a landing page. That keeps things convenient not just for the sales team, but also for prospects who want to access case studies or share them with other key decision-makers. To make your case studies as effective as possible, you'll want to distribute them to the right audience. Similarly to when you learned how to write a press release, the “right audience” isn't synonymous with the broadest audience possible. It's the people most likely to influence B2B buying decisions. The best distribution channels depends on those key decision-makers. The easier it is for them to find your case study, the greater the chance of them engaging with it. Your website is your virtual storefront to the world. It's one of the first places buyers will look in their quest to find the perfect solution for their business. Featuring case studies on your business website makes a lot of sense. Because customers will be doing their own research there anyway, making case studies available gives them the information they need while positioning your business as a true authority. Once you decide to make case studies available on your website, it comes a matter of deciding how to display them. There are several ways to do this. One of the most popular choices is to either create a virtual library of case studies, which visitors can browse to find the case studies most interesting to them. B2B buyers represent committees of people with different skills, industries, and areas of expertise. It's highly unlikely that every case study you create will appeal to everyone. How do savvy marketers respond? They make it as easy as possible for every segment of their audience to find the case studies most interesting and/or relevant to them. Creating a standalone landing page for each case study will help. Once people navigate to a page (usually from a library of case studies), the goal is simple: get them to watch, read, or download that study. Think of landing pages as “movie trailers” that get people excited about finding out what's in each full case study. This preview is your last chance to convince them to engage. The most effective layouts tend to be short and sweet. They grab your attention with a benefits-focused headline. They don't waste any time before jumping into a summary of the customer's challenge and how you helped them solve it. Choice quotes and statistics pique the reader's curiosity. Every element is streamlined to accomplish your goal. 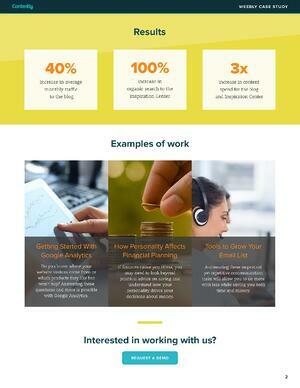 Just like case studies themselves, landing pages work best when text is broken up with plenty of visual elements. Adding a screenshot or two of the content inside showcases the production value – and gets people curious to see more. Have a look at some of the landing page examples below for some ideas how you could apply this! Forcing your website visitors to sift through a pile of case studies and find what's relevant to them is unrealistic. As busy as B2B customers are already, they just won't do it. That's where categorization and filtering come in. Think of how you might buy something on Amazon. The homepage is just the jumping-off point. With the click of a mouse, you can narrow your results by certain categories (beauty & health, sports & outdoors, etc.) and subcategories. Results can then be filtered by price, best sellers, reviews, and a lot more. You can recreate this personalized experience with your case studies. Instead of overwhelming people with a heap of content, give them the ability to focus on what's most relevant. Modeling how successful B2B companies organize their case studies (including the landing pages below) might help you get started. One of the best ways to create awesome case study landing pages is to study a few companies that are already doing them well. The following pages make it easy for visitors to find exactly what they're looking for within seconds. And the specific landing pages themselves are optimized for engagement. Check them out! Tip: Check out G2 Crowd's landing page builders category to find the right tool for your landing page. Live events – conferences, trade shows, and even webinars – are mainstays of effective B2B event marketing. They're well-suited for B2B because the emphasis is on building personal relationships. They're also great opportunities to distribute your case studies. You could print copies of written studies and give them to the prospects you meet. If you have a booth at a trade show, you could play video case studies for event attendees. The end of a webinar is the perfect chance to share a link to your case study library. The possibilities here are limited by only your imagination. Blending personal interactions with compelling content will set your company apart as someone to trust. Your sales team has limited time and resources. Why not give them another tool to increase their chances of closing every deal? Sales collateral, the materials used to support the pitch, can make the difference between landing a new customer – or losing them to a competitor. Case studies address last-minute objections and ease doubts. Even if the prospect leaves the meeting without buying, he or she can take the case studies and refer to them later. Print out hard copies for sales reps to use in their meetings. Do the filtering for the prospect by focusing on studies that are the most representative (size, industry, problem faced, etc.) as possible. In the meeting, you can walk through the material together. Industry journalists are always looking for new ideas for content. Your customer's success could very well become the subject of their next column! Start by identifying the top publications for each industry you serve. If you notice certain journalists writing about similar topics, they might be open to yours. Another good sign: media outlets that write about your competitors. Like B2B marketing in general, this is mostly a game of developing key relationships. HARO (Help A Reporter Out) is an excellent website to connect with journalists. Case study videos work great on your website, but that's just the start. You can also learn how to upload a video to YouTube (the second-largest search engine in the world) and other video hosting sites such as Vimeo. Another option: cut them into interesting clips and share them via social media. Businesses like Samsung post their case studies as playlists on YouTube. These are charts or diagrams used to represent data. They're also some of the most popular content shared on social media. You can distribute your case studies this way too. That's exactly what Kissmetrics did in its infographic calculating a customer's lifetime value at Starbucks. Your sales reps can break down salient points from case studies and use them for slides during presentations. This is an engaging way to walk prospects through the results you've achieved. To distribute them even wider, upload them to platforms like SlideShare. In certain situations, it makes sense to drive paid traffic to case study landing pages. You can use pay-per-click ads, social media ads, display ads in trade publications, and a whole lot more. You could also serve retargeting ads to people who have visited your website before. Effective case studies are full of testimonials, which are effective in their own right. You can pull out the most impactful ones and feature them on a testimonial page on your website. That gives you another opportunity to engage visitors who might not be ready yet to read a full case study. You've learned a lot about finding the best customer success stories to focus on, how to conduct case study interviews, and how to package everything into an unforgettable story. Now's the time to take that knowledge and put it into action. Understanding the fundamentals will save you a lot of time. But there's no substitute for first-hand experience. Here are few more case study tips and resources to help get you going in record speed. As more of your competitors catch on to just how effective B2B case studies can be, the challenge is making your stories stand out from all the others. Case studies aren't the place for generalities. When you're interviewing just one customer, anecdotes and results will come up that make them unique. These are the elements (“Your product saved our lives that time when...”) or (“We are saving $X a month since switching to your service...”) to focus on to make them compelling. Most B2B companies are producing a lot of marketing content beyond case studies. But each study is full of opportunities to point the audience to your reports, white papers, blog posts, and more. This keeps them in your orbit while providing the information they need, increasing credibility. If you do your job well, your audience will read (or watch) your case studies from beginning to end. They are interested in everything you've said. Now, what's the next step they should take to continue their relationship with you? Give people a simple action they can complete. That way you can move them closer toward becoming a customer instead of letting their interest fade. Even if your case story tells a compelling story, without a compelling title to match, it won't get the attention it deserves. Consider your title like a newspaper headline; do it well, and readers will want to find out more. Try to keep titles focused on customer benefits. Study a few principles of headline writing, and don't be afraid to turn to newspapers or the magazine rack for inspiration. A polished writing style and flashy visual effects are great. But they shouldn't come at the expense of clarity. For every sentence or second of video, ask yourself 1) what message you want to convey, and 2) whether you're being clear. Your busy prospects will thank you! B2B buyers don't have the patience to navigate a maze of menus and submenus just to find your case studies. Ideally, someone should be able to visit your website the first time and find this information within seconds. Some B2B companies fall for the temptation to go on and on about how great their products or services are. This makes their case studies difficult to relate to. Better to frame the story from the customer's perspective, because if you choose your subjects well, they'll be similar to the audience reading or watching them. B2B buyers comprise groups of people with different skills and interests. They're interested in different things. So it's impossible to connect with everyone in a single case study. For every study you create, tailor it to a specific audience. You'll make each stakeholder feel special by delivering this personalized experience. In most cases, your customers won't be in the same industry as you. It's easy to fall into old habits by using technical terms and industry jargon. But we can't afford to assume that our audience understands those terms. The risk of confusion is too great. Itching to get started on your next case study? These excellent free resources will help you tell the most compelling stories possible. Case studies are some of the most effective tools at a B2B company's disposal. Now you're well on your way to mastering them. Case study formats (and how you distribute them) might change as technology evolves. However, the fundamentals that make them effective – knowing how to choose subjects, conduct interviews, and structure everything to get attention – will serve you for as long as you're in business. Compelling stories are always in demand. Today's B2B buyers are tackling much of the research on their own. Many are understandably skeptical before making a buying decision. By connecting them with case studies, you're able to prove you've gotten the results you say you can. There's hardly a better way to boost your credibility and persuade them to consider your solution. We covered a ton of concepts and resources, so go ahead and bookmark this page. That way you can refer back to it whenever you have a question or need a refresher.